There’s not really any such thing as an average car parking space since vehicles come in all different widths, sizes, and designs. Therefore parking on unmarked gravel, as are the majority of spaces at PremiAir, cannot be narrowed to a specific maximum capacity. This is not so bad in winter when it is quiet but during the busy summer months it is smarter to upgrade to our car park that has marked out parking bays, wider spaces and is fully tarmacked. King Richard III, Henry the VIII’s private chapel, the palace of Helena of Adiabene, the Canadian Parliament, and a warship from the Texas Navy have all been found buried underneath the asphalt of parking lots. Even nearby to PremiAir archaeologists excavated the tomb of Vetta, princess of the Votadini tribe in 1977. 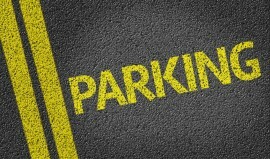 The two most common paving materials for parking lots are asphalt and concrete. Both materials are best installed when ambient temperature is 50 degrees or higher, but asphalt isn’t compromised by warmer temperatures. This also means that cracks and breaks in the roads can be repaired quickly and easily. Asphalt is made from bitumen and aggregate which is merely crushed stone mixed with the sticky by-product of refined petroleum. The mix is heated, poured, levelled and compacted to make a smooth, durable surface. Because of the petroleum content some people think asphalt isn’t the greenest paving option, but calculating the carbon footprint takes more than just the materials that go into it. The petroleum required for asphalt is a by-product that would otherwise be discarded. The lifespan of asphalt parking lots is greater than concrete, so there’s less wasteful demolition and disposal of old paving materials. When old asphalt is eventually replaced, the material removed is reused to make new asphalt.